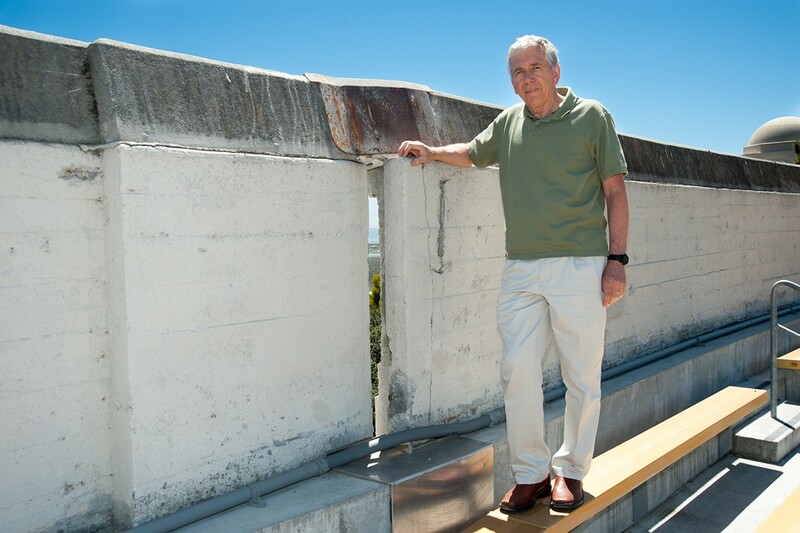 UC Berkeley professor Nick Sitar shows the gap at California Memorial Stadium due to Hayward Fault movement over the years. Stanford professor Zoback used to work for Risk Management Solutions and co-authored the 2008 study. She says a big lurch of the Hayward Fault would likely kill hundreds, and possibly thousands, of people. "But probably not tens of thousands," she said. A 2010 report from San Francisco's Community Action Plan for Seismic Safety Project estimated that a 7.2 earthquake on the San Andreas fault would make 27,000 buildings in San Francisco — about one in five — unsafe to dwell in. Nearly 4,000 buildings would need to be demolished, too. The report also estimated the earthquake would start more than seventy fires, which could destroy another 2,000 to 3,000 buildings. Total damages from the earthquake and fire might run $34 billion. Three-hundred people could die. The report warned that a repeat of the 1906 quake could kill nearly 1,000 people. The injury and death toll would have much to do with the hour that the earthquake strikes, Zoback says. The worst time of day to experience a large earthquake in the Bay Area would be mid-afternoon, when many people are at work. "Having lots of people in buildings is the concern, since, if just one of them collapsed, you could have lots of people killed," she said. Though the Loma Prieta quake gave millions of people an idea of what a big earthquake feels like — and also revealed weak points in social infrastructure and building codes, and helped officials map out developed areas of artificial fill prone to disastrous shaking — it wasn't a serious field test of the Bay Area's seismic tolerance, according to Rundle. "So it's a very big problem," he said. "An earthquake [on the Hayward Fault] is going to be much stronger and very different than what we saw in Loma Prieta." Experts say they are likely to collapse in an earthquake, as the ground floor gives way, followed by the floors above. In China in 2008, thousands died in the city of Beichuan when a 7.6 magnitude shaker turned hundreds of such so-called "soft-story" buildings into bloody rubble heaps. Some of the worst damage in the '89 quake, in fact, was seen in soft-story residential buildings in San Francisco. And in the '94 Northridge earthquake in Los Angeles, sixteen people — probably sleeping at the time — died in a single soft-story building when it crashed down upon its own foundation at 4:30 in the morning. There are estimated to be about 15,000 such buildings in Los Angeles today. Oakland has about 1,500 soft-story structures vulnerable to collapse, according to estimates from the city's Resilient Oakland Initiative, launched in March 2015. A source who did not wish to be named said that upgrading soft-story buildings has slipped dangerously low on the priority list of Oakland officials. The city's chief resilience officer, Kiran Jain, did not return a call to discuss this issue. Dana Brechwald, resilience planner with the Association of Bay Area Governments, also did not respond to two calls and two emails. The city of San Francisco is doing better and now requires landlords to retrofit soft-story buildings with support pilings at the ground floor. Still, more than 5,000 soft-story, multi-unit buildings remain. And about 120,000 people live in them, according to Patrick Otellini, San Francisco's director of earthquake safety. If these buildings aren't retrofitted, he says, many people are going to die or be injured. Otellini says the retrofit work should be completed by 2020. If an earthquake strikes before then and destroys a significant number of San Francisco's soft-story residential buildings, the city will face an instant housing crisis. That, Otellini explains, is because most of the units within these buildings are currently rent controlled. If these buildings collapse, they will be rebuilt in the absence of such tenant-protection codes. Former residents would likely be priced out of the housing market. "Then, we could have 100,000 people without homes," he said. While San Francisco's Marina District received lots of attention after many soft-story buildings collapsed or were damaged in '89, the problem, he said, occurred across San Francisco rather equally. "The one thing that binds these people together is the rent-control aspect," Otellini explained. "They do tend to be people who don't have [the] security of home ownership." He also says soft-story structures are hardly the extent of the Bay Area's quake vulnerability. "They're just the low-hanging fruit." What's also concerning is that more than fifty Bay Area health clinics are on the list of buildings likely to collapse or be irreparably damaged in a large earthquake, according to California Human and Health Services' data from May of this year. Using a scale of one to five, with five indicating structural soundness, the agency assessed hundreds of hospitals and clinics statewide for seismic structural integrity. Of 147 in the East Bay, 27 received a rating of one, which means that the facility poses a "significant risk of collapse and danger to the public," according to the state. Twenty-five more buildings were rated two. Much of the developed area along the Bay's shoreline — such as the Port of Oakland, for one — sits on artificial fill. "And we saw how well artificial fill held out in Loma Prieta," Zoback said, referring to San Francisco's Marina District, where liquefaction practically overturned entire homes and duplexes. "That is how we might see a large loss of life," he said. If you stroll along Dwight Way in Berkeley, the hustle of downtown disappears a block at a time. Near the top of the long grade, the street eventually dead-ends at a public park. But never mind the idyllic Berkeley Hills scenery; be sure to take notice of the cement sidewalk. Just past the intersection with Hillside Avenue, the curb abruptly turns in several inches, offset by the slow — slow — migration of the Earth's surface on either side of the Hayward Fault. This is rare, and marvelous, visual proof of plate tectonics in action. The south wall of the UC Berkeley campus stadium, too, shows unmistakable evidence of what scientists call "fault creep." So do numerous other curbs, rock walls, and sidewalks along the fault, which scientists say is creeping several millimeters every year. Similar engineering was used about a decade ago to protect the major pipeline that delivers water to 800,000 people on the west side of the East Bay hills, according to Andrea Pook, a spokesperson with East Bay Municipal Utilities District. EBMUD's main transmission pipe leads from the Delta and through the hills via the nine-foot-wide Claremont Tunnel. Inside the tunnel, where the pipe crosses the Hayward Fault, it rests on rollers so that, when the fault slips, only the tunnel walls will rupture, allowing the pipe to shift unharmed. Four major gas transmission lines near the Hayward Fault are potentially vulnerable to rupture, according to Melissa Subbotin, a PG&E corporate-relations officer. She says the company's top priority for immediately after an earthquake is locating leaks and remotely turning off gas lines as needed. She says the company runs a fleet of ten specialized vehicles fitted with methane-detecting technology that can pinpoint gas leaks under the sidewalk. These vehicles cruised the streets of Napa following that city's 2014 earthquake and will certainly be deployed in the East Bay when the Big One hits. Zoback, for one, believes these facilities represent a serious health and fire hazard. "The fault runs right by them, and they have miles and miles of pipes," she said, adding that she would appreciate some transparency from refinery managers. "Everyone else, from Caltrans, to PG&E, to East Bay MUD, to BART — all of the other infrastructure owners — have made big investments in seismic upgrading, and we just don't know anything about those refineries," she explained. Hudnut says the nature of the Hayward Fault makes it, from one point of view, less dangerous than other faults. Yes, it has the capacity to pack a destructive seismic punch. Yes, it runs through a heavily developed urban zone. "But we're fortunate in a way with the Hayward Fault, because we know exactly where it is, because of fault creep," he said. "Other faults don't experience fault creep and aren't so easy to pinpoint, but with the Hayward Fault, we know exactly what buildings it runs through." In Sacramento, state officials are taking the risk of an extremely deadly earthquake in California very seriously. The governor's Office of Emergency Services has three earthquake-specific plans. 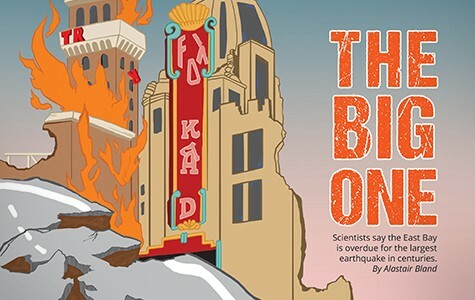 One focuses on the aftermath of an earthquake on the Cascadia subduction zone, an ocean-floor fault running from Northern California to British Columbia. John Rundle, a distinguished professor of physics and geology at UC Davis, says the Cascadia subduction zone experiences a magnitude 8 to 8.5 earthquake every two-hundred to three-hundred years on average. "It's now been more than 300 years since the last one, so it isn't inconceivable that we could get a large tsunamigenic earthquake in the next 20, 30, 50 years," said Rundle, who has helped design an earthquake-forecasting system for the consulting group at OpenHazards.com. "It's definitely something we should be concerned about." Seismologists have warned that a large earthquake on this fault will cause a tsunami about as deadly as Japan's 2011 catastrophe, which killed more than 10,000. Most of the impacts would occur north of Sonoma County. In the aftermath of such an earthquake, the City of Oakland's top focus will be protecting people. "Our [No. 1] priority is life safety, followed by protection of property, the environment and return of a healthy economic state to the City of Oakland," the Fire Department's emergency manager Cathey Eide wrote in an email. Even traumatized pets, she said, are a concerning issue. And although Sitar at UC Berkeley thinks looting and home break-ins could surge post-quake, he agrees that society will not entirely break down. "Not all the roads will be out, not all the bridges will be down," he said. The group's executive director is Glenn Pomeroy, and his job is to at once "not indulge in fear tactics," he says, but also focus on how "the risk is real" when it comes to the Big One in the Golden State. "The scientific community says there's a 99.9 percent probability of a 6.7 or greater happening in California in the next thirty years," he explained. And, if you narrow it down to Northern California and the Bay Area, there's a 76 percent of a 7.0 in the next thirty years, he said. "And a 7.0, as odd as it sounds, is three times stronger than a Northridge 6.7." And Northridge in '94 did $40 billion worth of property damage, half of that to homes. "And people think that the government will come in and bail them out, and that doesn't happen," he said. "The federal government isn't in the business of rebuilding uninsured homes." For East Bay resident Jeffrey Royer, whose home sits almost exactly on the Hayward Fault, his personal earthquake-preparedness plan is loosely built on the assumption that his home will not be entirely demolished. He keeps flashlights handy around the house. "And there's water in the water heater and the toilets," he said. But Royer isn't particularly worried about earthquakes. "I don't really think about it," he said. "What can I do?" In his own home, Sitar and his wife each have their own earthquake backpack containing a flashlight, gloves, freeze-dried food, and a blanket. Sitar isn't very concerned about drinking water, and he says the common advisories that people keep a drum of potable water in their basements or backyards, to tide them through the dry spell likely to follow a large quake, are probably overly cautious. "The chances that we'll be without water for seven days are very, very low," the professor said. "The fact is, there's a lot of water out there." No matter how destructive the Hayward Fault's next lurch — and it will be destructive — experts assured that the Big One will not be the end of the world. "Don't get me wrong," Hudnut said. "The number of people who are going to be killed will be really, really bad. "But it won't be something we can't recover from if we just prepare for it."